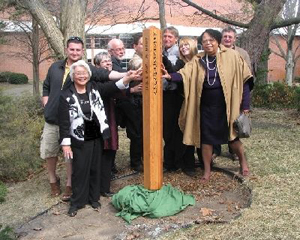 This Peace Pole was created by Delta College students, faculty and staff. It was dedicated on the 27th of March 2009, and stands as a visible symbol of Delta’s commitment to creating peace and understanding throughout our world. Other Peace Poles were also created at Delta. Two of these were sent to our sister institutes–the Rift Valley Institute and Tracom College in Kenya— given as tokens of friendship, and symbols of that, through shared vision and work, the potential for global understanding and peace knows no boundaries. One will be sent to Japan and another to China. Another will go to the Zilwaukee International School in Saginaw County, and one will go to Christa McAuliffe Mi.